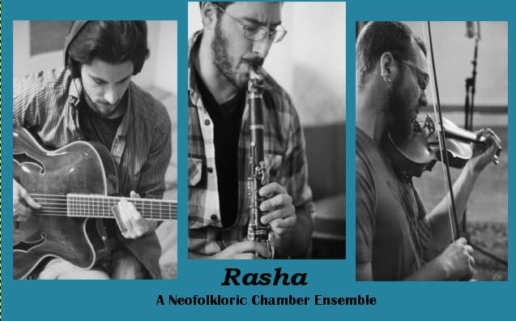 Rasha is a neo-folkloric chamber ensemble featuring Max Rose on resonator guitar, Ethan Rubin on fiddle, and Jon Polit on bass clarinet. Using unique instrumentation, Rasha re-imagines the musical traditions of Spain, Greece, Scotland, and more in unorthodox arrangements of folk music and modern compositions inspired by those styles. The band will offer background and commentary between tunes in an effort to help the audience dig deeper into the similarities and differences that make these musical traditions so exciting.